Five pieces of Hand battered Cod served with homemade chips and a side of coleslaw. ﻿Two soft tacos stu﻿ffed with grilled chicken tossed in a Korean BBQ sauce, house made Asian Slaw, srirachi sour cream, and fresh cilantro. Two Soft tacos stuffed with our hand breaded chicken tenders tossed in buffalo sauce topped with lettuce, fresh pico de gallo, shredded cheese and drizzled with ranch. 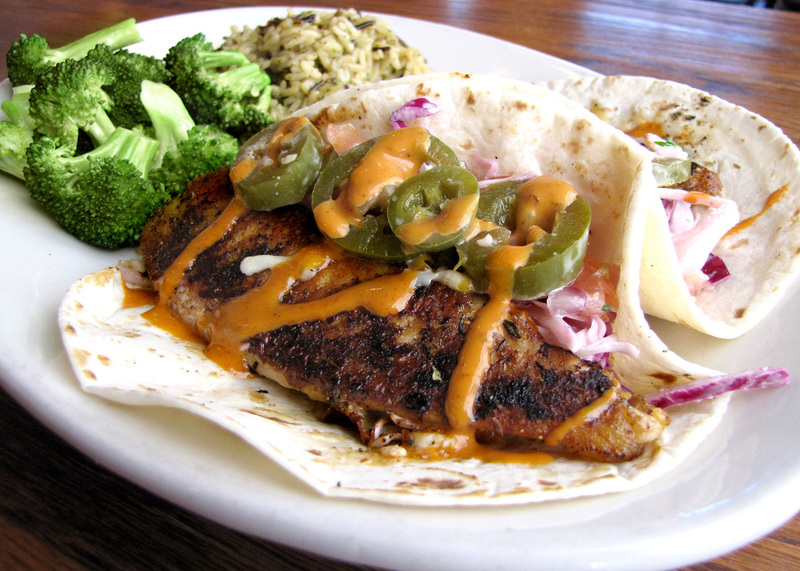 Two soft tacos filled with pan seared Tilapia with a blackened blend of spices, shredded cheese, pickled jalapenos, Pico de Gallo slaw drizzled with chipotle mayo. Served with two side dishes.